Why I am in this trade? 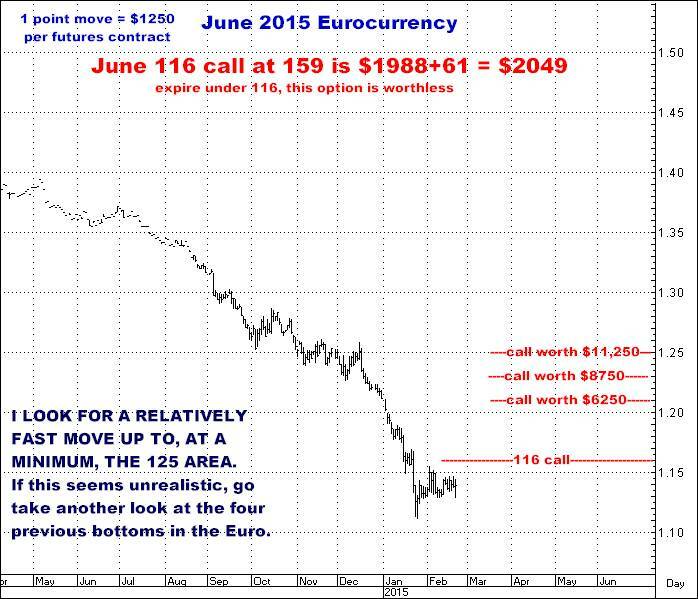 Why I am pushing so hard to get people to Buy the Eurocurrency? And saying, “Buy it NOW”? And no surprise, this is exactly where they ALL are today…They are all in agreement…All the bleating painted faced sheep are telling you Europe is toast and so is the Euro. Second reason I love the Euro here? Because of what I have seen historically, again, too many times to count….As a function of the currency markets being, by far, the biggest on the planet (MANY billions of dollars traded every day), when they DO make a significant bottom, meaning, when you have a whole world of money positioned in the wrong direction, the size and velocity of the initial move up can truly be astounding…which is exactly what I am expecting in the Euro now…and also exactly what can be seen on the following charts of the last four bottoms we have seen in the Euro. And don’t kid yourself…Media/Analytic sentiment at EVERY one of these bottoms was loudly, “logically” and unanimously bearish…telling you “Sell!” precisely when it was time to BUY…just as it is today. First note…Just because it has happened this dynamically four straight times does not mean it has to happen that way again…or at all (if I am wrong). But these ARE big numbers and they ARE very short periods of time…Really. I don’t know how to describe being up 10 points, or $12,500 per contract in a matter of weeks, or a few months, as anything but “fast and big”. And to me, if your opinion is, “I want to buy it”, what this means is you can’t be waiting around to see it get started…to sit on the sidelines until you reach that mystical point where you are “sure” it’s going up. When something can move 5-6 points in a matter of days or weeks, you are kidding yourself if you think you’ll watch it jump big from one day to the next few…and then feel like diving on. You won’t. You’ll be sitting there thinking, “I’ll get on when it pulls back”. And it DOESN’T. Look…It ain’t different this time. I’ve heard this malarkey about Europe going under, or the EU falling apart, for the last decade. It’s NOT going to happen. As I wrote under the same circumstances several years ago, http://www.crokerrhyne.com/newsletters/06-06-12.htm , Europe was blown to pieces by world wars twice in the last century…and it’s still there. Still cohesive. Still one of the world’s biggest marketplaces and every bit the economic, immigration and social magnet the USA is. Go to Germany, or France, or England or Scandinavia and tell them, “Well, you guys have had it!”, and see what the response is. The USA ain’t going down the tubes…and neither is Europe…WHATEVER happens in Greece or Spain or from whatever “crisis” the media gets fixated on…Believe me, if Greece fell off the map, Europe and the EU would still be there…still be a WHOLE CONTINENT THAT IS JUST AS ALIVE AS WE ARE. 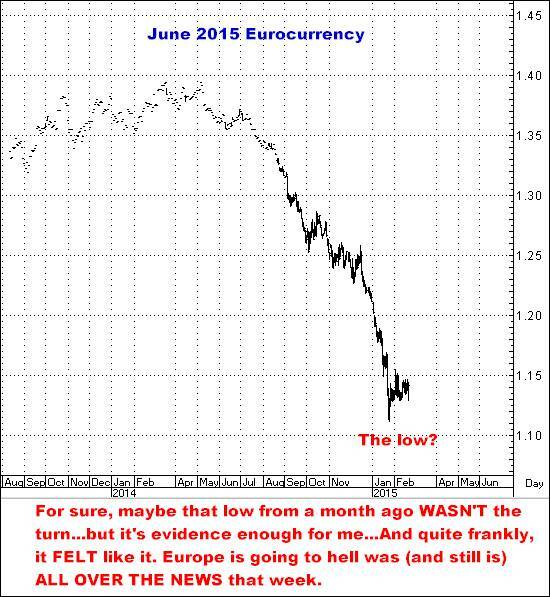 THE EURO IS A BUY HERE. AS I’VE POINTED OUT REPEATEDLY IN THE LAST WEEK, THIS IS JUST ONE MORE SCENARIO WHERE THE WHOLE SPEC WORLD, AND ALL THE FOREVER WRONG TALKING HEADS, ARE OVERWHELMINGLY LOADED ON THE SHORT SIDE. 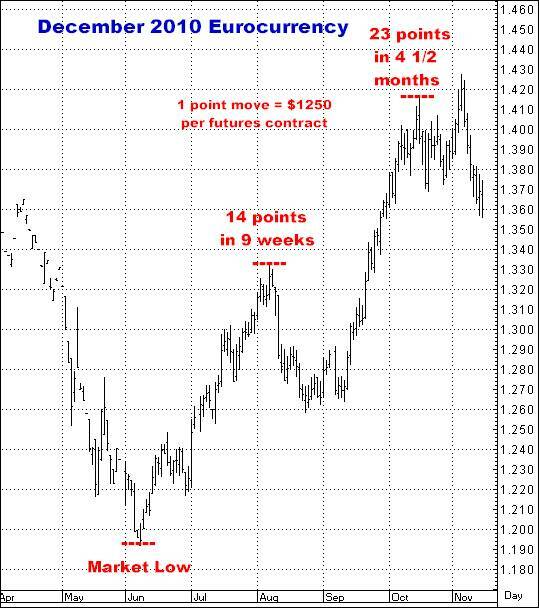 I THINK AT LEAST A 10-15 POINT UPSIDE MOVE IS ALREADY UNDER WAY. I LOUDLY (YES) RECOMMEND BUYING CALL OPTIONS HERE. FOR MY WAY OF THINKING, I JUST DON’T THINK IT GETS ANY BETTER THAN THIS. And as noted above, I think you need to be there now…I truly believe that, with the market already 2-3 points of its low, this is absolutely an ANY GIVEN DAY sort of situation…and waiting around until you feel “comfortable” about doing this is NOT where your head needs to be. And as I wrote last week, YOU BUY WHAT EVERYBODY "HATES". Always hard to do but it IS how this stuff works…. In every one of these 4 most recent bottoms, sentiment was essentially EXACTLY the same as it is now. 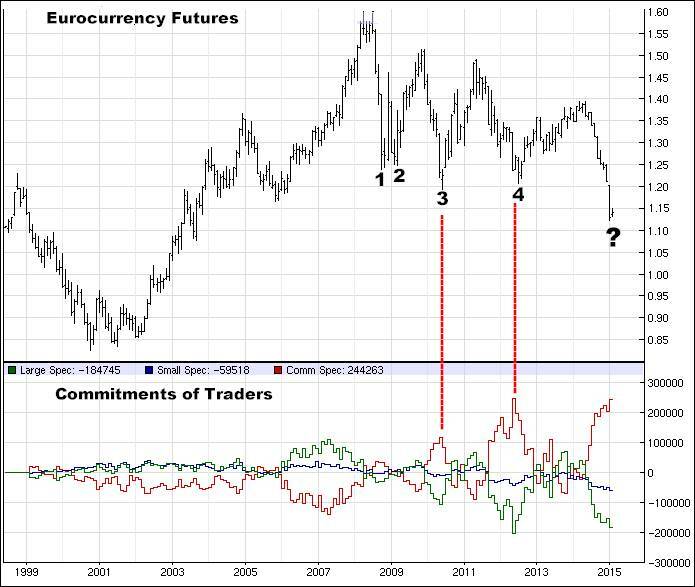 I keep beating this to death, but same as before, Speculative Traders are the most short they have been and Commercial Traders (hedgers) are dead opposite them…again…at RECORD LEVELS. 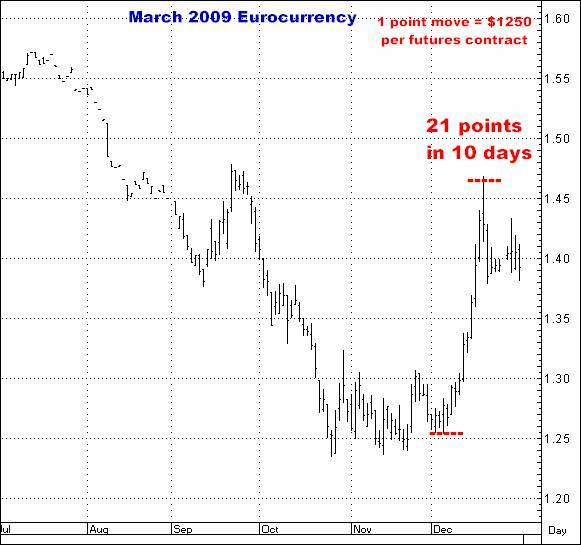 Some of you will recall that long ago my research led me to ‘discover” what I call the Perfect Chart…that after researching 1000’s of historical moves, I came up with what I think is the highest probability situation you ever find in futures trading. I won’t go into detail here (but hope to soon) as to specifically what that chart is…but I can tell you the chart below is EXACTLY (and I mean EXACTLY) that Perfect Chart. To be sure, it does NOT mean the trade has to work but it IS the best potential set up I know in this business. 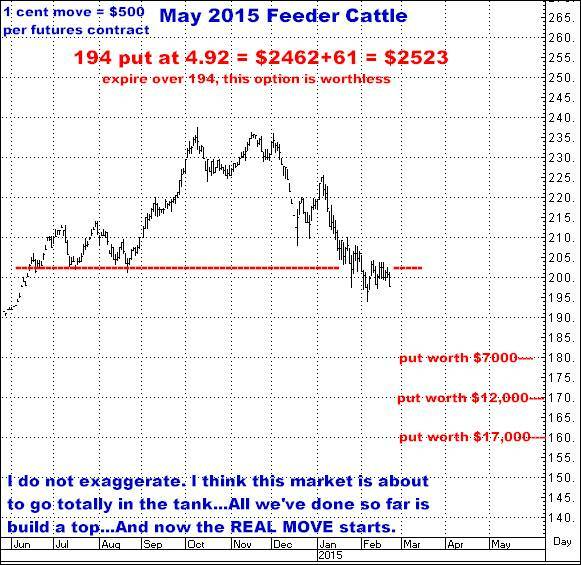 I SEE FEEDERS NOW SITTING ON A PRICE CLIFF and I DO BELIEVE AN ABSOLUTE PRICE COLLAPSE IS DEAD AHEAD. In essence, trading should be simple…All we are ever really trying to do get on a market in the direction it is moving (and hopefully moving big)…and that is what this chart is about…Yes, it can turn around at any time but right now it looks to be pointing south…and breaking new lows from here DOES present, I believe, way above average odds that its actual target IS down at the 160 level...Furthermore, like the Euro, this too, is not a “wait and see” situation. I think you get on this SHORT right now, and beyond that, if you are already on it, you get more. 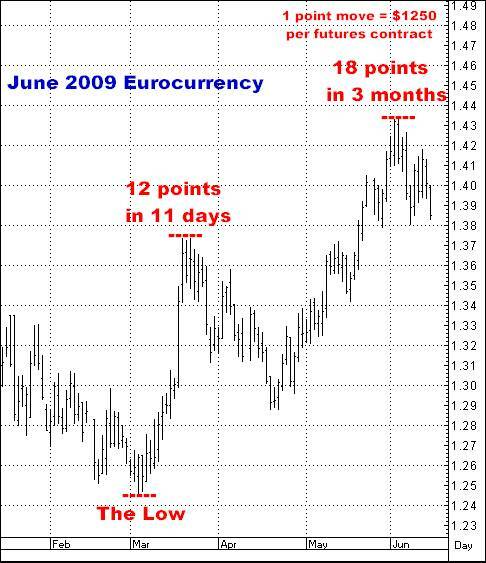 All price charts use data from Interactive Data. 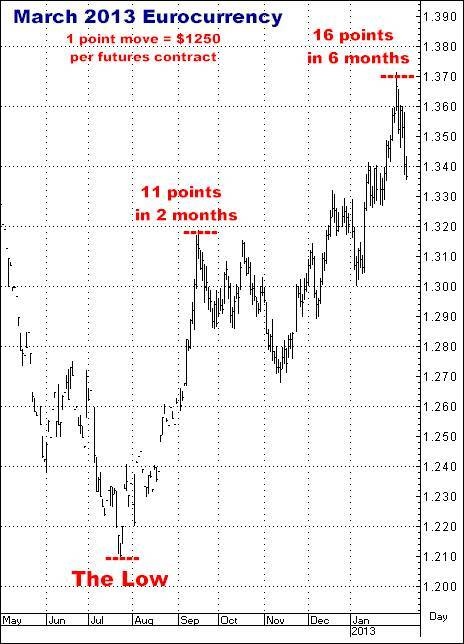 The Commitments chart comes from CRB.